Jews of all stripes enter village from which Fogel family murderers came, to pray at burial site of priests Elazar and Itamar. 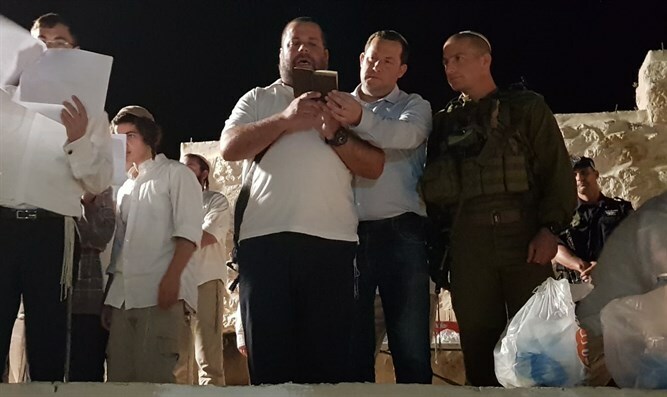 Hundreds of people, observant and non-observant, last night arrived, in coordination with the Shomron Regional Council and directorate of Joseph's Tomb and holy sites, and with the approval and security of the IDF, to say selichot [prayers of repentance traditionally recited during the period leading to Rosh Hashanah] at the graves of Itamar and Elazar, sons of Aaron, who are buried, according to tradition, in the hostile village of Awarta, from which the murderers of the Fogel family came. According to the Jewish, Samaritan, and Arab traditions, Elazar and Itamar, the sons of Aaron - the first High Priest of Israel - are buried in the village of Awarta, and the “70 elders” mentioned in the Torah as leaders of the Jewish people are buried in a cave nearby. In 1235, Rabbi Yaakov Hashaliach, who visited Israel, described in his book: “And the village of Awarta to the left ascending to Jerusalem - there is the gravesite of the priest Itamar, and it is a very pleasant place.” The biblical passage in the book of Joshua (24:33) relating, “And Elazar the son of Aaron died, and they buried him on the hill of Pinchas his son that was given to him on Har Ephraim,” is believed to be referring to the location of Awarta. The Shomron Council said that, on September 27, an organized entry to the tomb of Joseph will take place ahead of Yom Kippur.